1865 Seated Liberty Half Dime is One of the Rarest Coins in the Series. The Seated Liberty Half Dime was minted from 1837 to 1873. There are four varieties, differentiated by the presence of stars or no stars, arrows at date to signify weight reduction, and the relocation of UNITED STATES OF AMERICA from reverse to obverse. The 1865 is an example of the 4th variety, and ranks among the rarest dates in the series. Only 13,000 business strikes were issued, along with 500 proofs. There are about 90 individual dates available for collecting in the Seated Liberty Half Dime series. Of this number, more than 80 of them are very common, valued at less than $100 in Good condition. The 1865 half dime is typical of most of the scarce dates in this series in terms of value and collectibility, which is why it was chosen for tracking in the Rare Coin Values Index. The most famous Seated Liberty Half Dime is the 1870-S. There is only one known specimen in existence, and it seldom changes hands. The next time it goes up for sale, it should sell for more than $1 million! 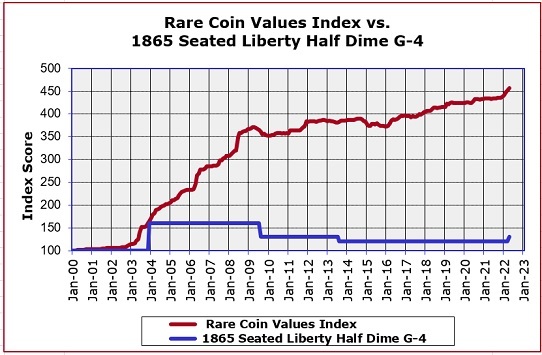 The 1865 Seated Liberty Half Dime is one of the rarest dates in the entire Seated Half Dime series of 1837-1873, yet it (the blue line above) rates far below the composite score of the Rare Coin Values Index (red line). Both graphs start in the Year 2000 at a baseline score of 100, and chart percent change in value from that point to the present, The Index is the combined score of 87 coins chosen to represent the US rare coin market. The 1865 Seated Liberty Half Dime in one of the coins included in the Index score. The Index is updated monthly.